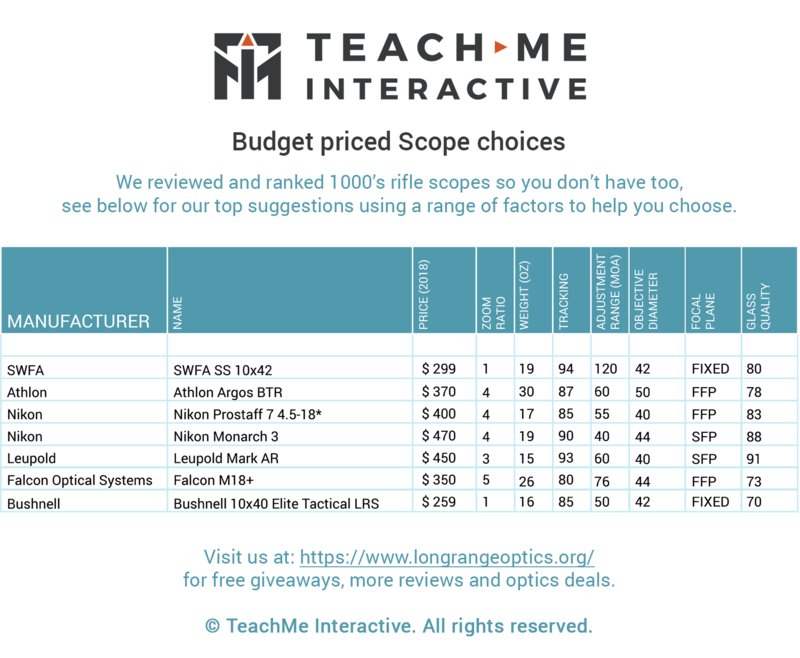 This table represents the best budget scopes we could find. We would suggest going higher in budget if you can, but if you can’t these scopes will serve you well. 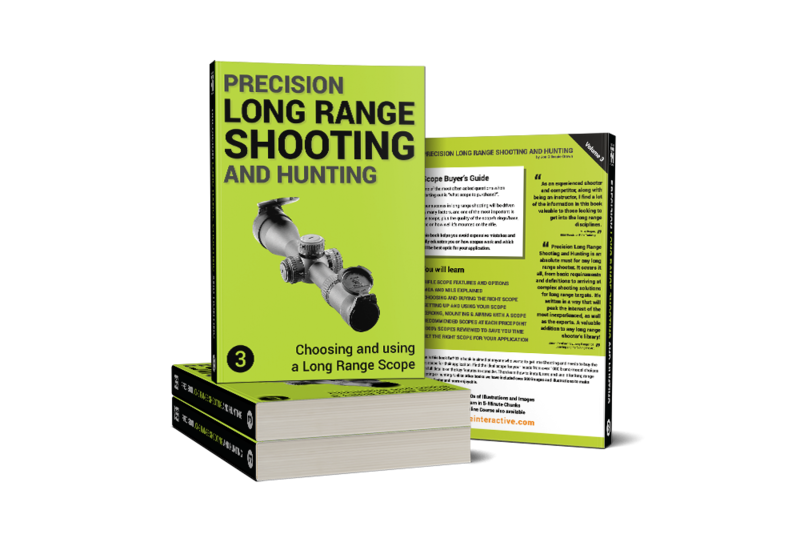 We recommend spending more on your scope than anything else in your budget, and we suggest saving up for a better scope, buying a lightly used one or moving more of your budget into this purchase versus getting a budget scope. The issue is not the scope itself as much as is the likely need to upgrade quickly as your needs changes versus waiting and getting a better scope from day one. 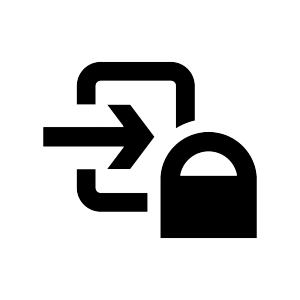 Prices are approximate street pricing found online at the time of the research, so use them as a rough guide only. Note: None of these scopes are ideal for extended ranges due to internal adjustment restrictions. You will definitely need a 20 MOA base to use them effectively. SWFA SS 10x42: Beginner scope, everything you want nothing you don't need. Great glass clarity and turret tracking. Durable thanks to fixed power. Athlon Argos BTR: FFP, illuminated, Christmas tree style reticle, great features in a good budget scope. Lacks glass quality and tracking of higher priced scopes. Made in China. Nikon Prostaff 7 4.5-18*: Quick zero, amazing glass for the price, good tracking, capped, target turrets or spot on turrets. FFP recommended. Nikon Monarch 3: Quick zero, amazing glass for the price, good tracking, capped, target turrets, better glass than the Prostaff 7 for a slightly higher price. Leupold Mark AR: Leupold makes great scopes. The Mark AR is one of the best options for AR long range scopes. Lacks features and is SFP but the tracking, glass and customer service from Leupold make up the difference. Falcon M18+: Very similar to the Athlon Argos BTR for value, but it suffers from poorer glass clarity and a few design choices. UK based company. Bushnell 10x40 elite tactical LRS: Bushnell is a name recognized even outside sports shooting, the 10x elite tactical LRS is a great scope but suffers from a few tracking and glass issues compared to the SWFA.